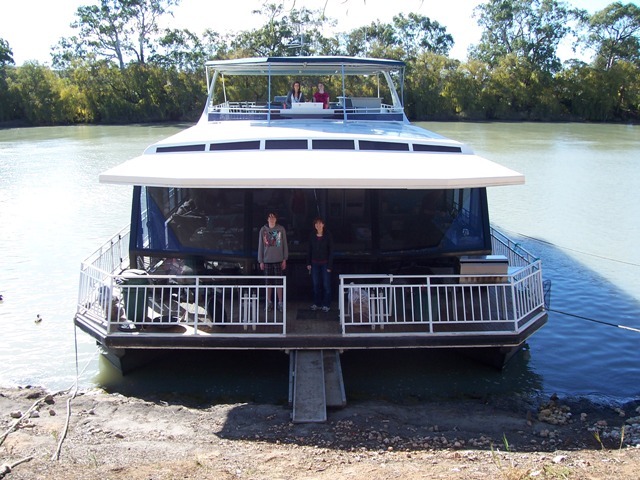 A day and a half cruising up the Murray river on our Expressions houseboat we landed at Swan Reach, once past the ferry we moored below the pub on the river bank, there is ample parking for about 3 large houseboats and additional parking on either side of the ferry on both banks of the river. If you have kids it’s worth stopping on the other side and taking a free trip across the ferry. 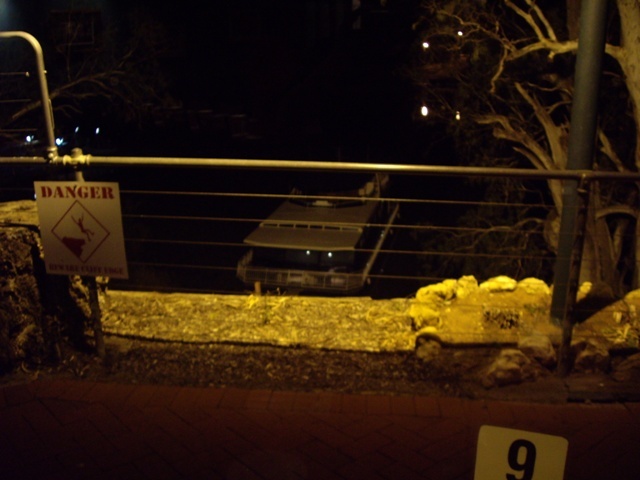 The pub has a friendly atmosphere quite laid back and feels like you are a local. The décor is a little dated but very comfortable and fits the historical elements. For those interested in the local history there is a great deal of memorabilia taste fully adorning the buildings walls. Set upon the top of a cliff face this historical pub is well worth the 10 minute walk from the houseboat mooring. The meals would fit in any city restaurant of upper end pub, but the prices are quite reasonable. All the produce is locally sought and on the night we went in the meat man had not been able to deliver the Eye Fillets that we got our hearts set on. I must admit the Poorhouses’ did not disappoint the meat had been hanging for 12 days and was cooked to perfection a true medium. Tender and juicy it had been rested to perfection, the vegetables that had been baked had a smooth country lard flavour, it took me back to growing up and enjoying Sunday lunch as a child. 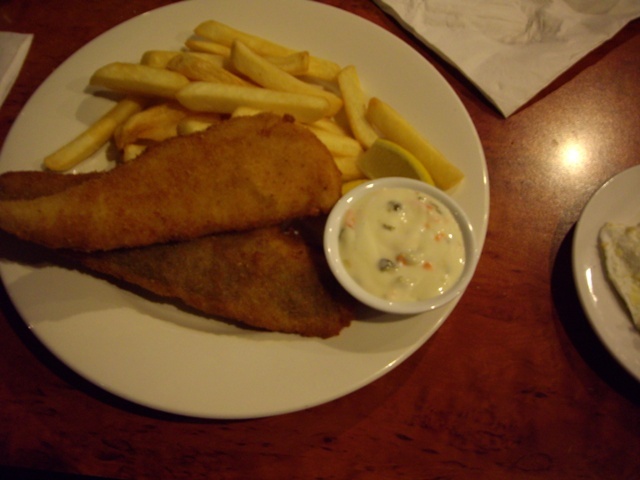 The Butterfish was moist and flaky, we went for a crumbed version, but you could have chosen to have it battered we chose a side of chips instead of roast vegetables. Great value here. 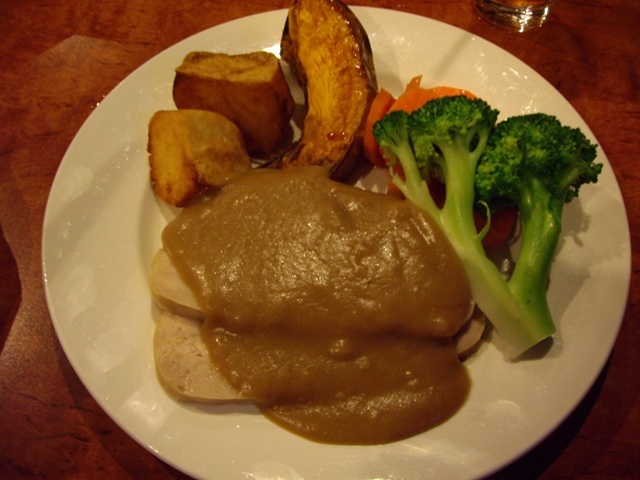 The Roast of the day was a hearty serve of Roast Turkey, was moist and enough with the vegetables (unfortunately it came with a non-gluten free gravy option) otherwise it was a value meal. I must admit we did not ask if there was an option for gluten free sauces, but I feel the kitchen would not have too much issue with this request as they treated us as if we had been guests in their homes. The obligatory Australian meal had to be ordered, yes you guessed it Garlic Prawns on a bed of rice, and in this case they where a hit. The prawns fresh and sweet (not frozen) the garlic butter with a hint of chives was a fresh accompaniment to the meal. 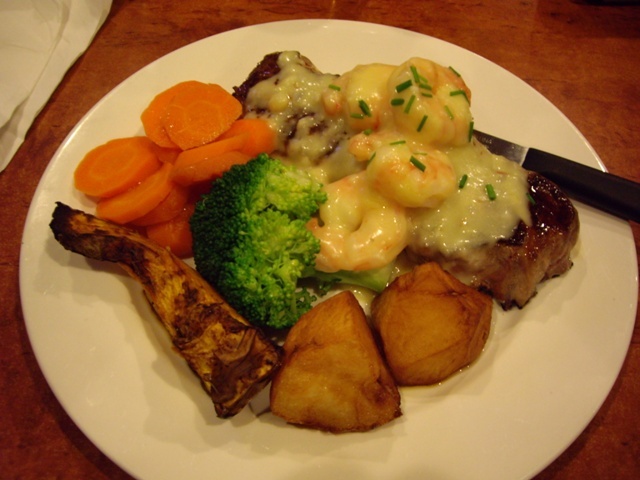 You usually expect a fatty sludge when you order this meal which generally reeks of garlic. This Garlic Prawns is up there with the best we have ever had and great value. The next obligatory Aussie favourite chicken Parma, or at least grain fed chicken breast fillet, this was for a plain eater it had the option of gravy, or the following sauces, Pepper, Dianne or Mushroom. 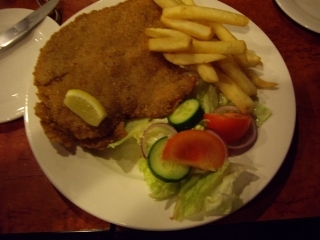 The chicken was fresh and the crumbing quite light it came with vegetables or chips and we chose ships. Drinks where at bar prices which is reasonable almost RSL pricing and if you are lucky with the machines or Keno you can end up having a really cheap night. Then there was the Cajian Chicken Caesar Salad, which looked fantastic and was ordered less the anchovies. 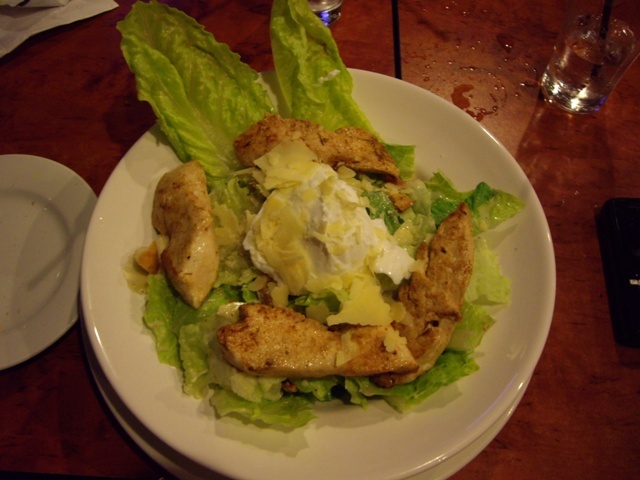 The soft boiled or poached egg for the top was cold and almost hard boiled, but the rest of the salad redeemed itself, all in all a fresh alternative to the heavy meals the rest of us went for. 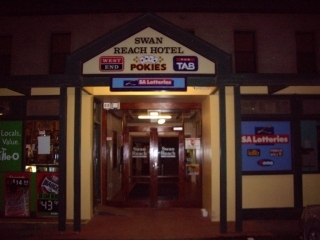 The Swan Reach Hotel is located in Main Street Swan Reach South Australia (08-8570-2003) if you are in the area or just touring the Barossa Valley you would do yourself a favour to visit the Swan Reach Hotel, they also have accommodation at reasonable pricing but you know the rule please check first as prices can vary dependant on the season. Nothing like a houseboat for a vacation. You can say that again I have tried many holiday’s and this was the most relaxing. Thanks for you comment keep well and hope to hear many more from you.